Almost every odorant has two sensory qualities: in low concentrations it evokes an odor, whereas at higher concentrations it also evokes a burning or stinging sensation in the nose. Odors are transmitted by olfactory nerves to olfactory processing areas in the brain, whereas irritant qualities are processed through a separate chemical sense known as chemesthesis, which conveys information through the trigeminal system. The smell of nicotine is described as being earthy or moldy when experienced in a low concentration, and also evokes a burning or even a stinging sensation when applied at higher concentrations. We used nicotine to examine whether trigeminal cortical areas are activated in the brain by suprathreshold concentrations of this stimulus. We determined individual olfactory detection thresholds for nicotine in healthy occasional smokers using an air-dilution olfactometer. Then we used nicotine concentrations at or just above the individual olfactory threshold to stimulate these subjects during a functional magnetic resonance imaging (fMRI) experiment. Subjects reported that they reliably perceived the stimuli as being odorous. Consistent with the perceptual experience, the fMRI revealed activation of olfactory cortical areas. Trigeminal cortical areas also were activated, even though the subjects never or only rarely perceived a burning sensation in the nose. Our results indicate that nicotine activates both the olfactory and trigeminal systems, even at low concentrations that do not consistently lead to burning sensations. 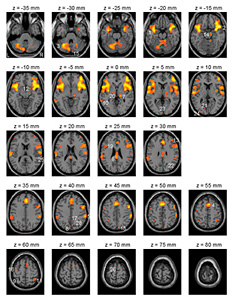 Photos 1 and 2 show brain activation maps following intranasally applied nicotine stimuli in concentrations at or slightly above individual olfactory detection thresholds. 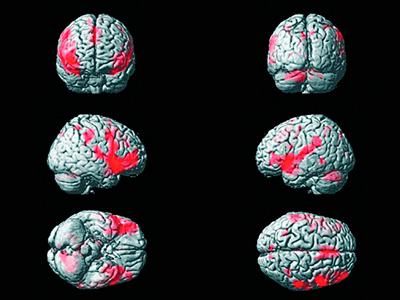 A brain activation map (not shown) following intranasal stimulation with suprathreshold concentrations of nicotine showed activation in the middle cingulate gyrus, supramarginal gyri, right middle frontal gyrus, left posterior cingulate gyrus, right subcentral gyrus (secondary somatosensory cortex, S II), bilaterally in the posterior insula, right inferior frontal gyrus (triangular part), left inferior frontal gyrus (opercular part), left thalamus (ventrolateral posterior nucleus), right thalamus (lateral pulvinar nucleus), right piriform cortex, right posterior orbital gyrus, and bilaterally in the anterior insula. This work was done as part of Albrecht’s doctoral dissertation at the University of Munich. Research indicates trigeminal cortical areas are activated in the brain by suprathreshold concentrations of nicotine.